The hottest dance group in the universe, The Planets, has eight members but they might begrudgingly allow another entry in to the team if they can be suitably impressed. 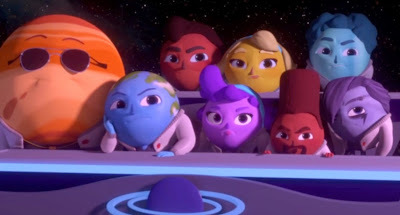 A competition is held to find the missing planet so that eight might become nine. At home, young Pluto does not think he has what it takes, but receives encouragement from his best friend, one of his satellites you might say! Charmingly made by the creative team of Millivette Gonzalez, Tabia Lees and Valerie Sattazahn this will have you rooting for the little guy of the solar system all over again. Stellar Moves is – and you may not believe this such is the high standard of animation - their senior thesis short film. It was produced at Ringling College of Art and Design (if you want to study computer animation in the USA, then this is always in the top three places to go). No doubt they will be inviting the trio back to give talks to their undergraduates in a few years.